Published Saturday, March 31, 2018, OK personal/derivative use; link www.lovethatimage.com. 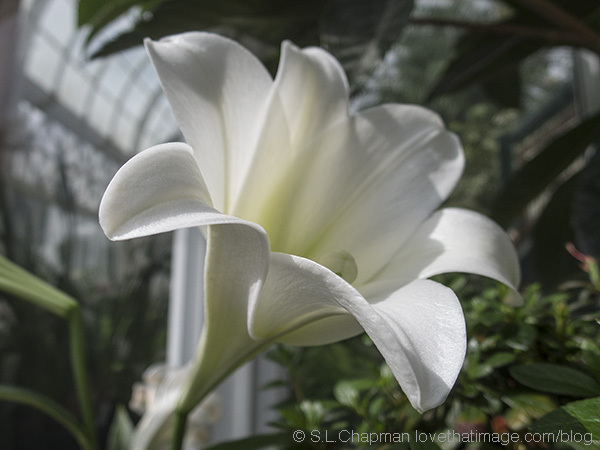 Here’s a white Easter Lily for you, courtesy of Seattle’s Volunteer Park Conservatory. Have a wonderful day! Connecting to Through My Lens Monday, Macro Monday, Our World Tuesday, Pictorial Tuesday, Tuesday’s Wordless Wednesday, Wordless Wednesday, Wednesday Around the World (WATW), Floral Bliss Wednesday, Floral Friday, Pink Saturday, Shadow Shot Sunday 2, My Sunday Photo, and Sunday Snap. Happy Easter and thanks for sharing such a pretty lily. I love white flowers at Easter. Beautiful photo. I hope you had a wonderful Easter. Blessings to you! Gorgeous macro shot of the Lily! What a beautiful, beautiful white lily! hopped by here thru Wordless Wednesday. White lilies are so beautiful – your photo is superb! Lovely photograph of an Easter lily. My local church always has a display of lilies at Easter.